RiftCat: Dev Update #35 - VRidge 2.0 Beta is here! Dev Update #35 - VRidge 2.0 Beta is here! This is the biggest update so far. VRidge got rewritten from scratch and it has to be released in a different way than our usual update method. 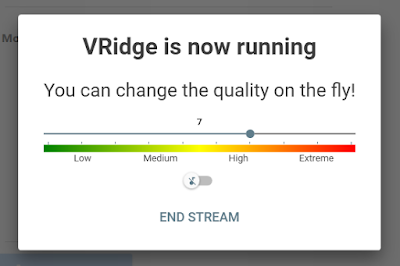 Remember that this is a Beta version of VRidge 2.0 - we need your feedback to fix all potential issues that might come up (there are over 10 000 different Android devices out there - it’s hard to test them all). Please send us feedback, suggestions and bug reports to support@riftcat.com - it is crucial if we want this update to become a success. What you will find in the VRidge 2.0 Update? New design with user experience as primary objective. Registration will no longer be required to try VRidge! Need to find the perfect setup? You will no longer need to restart VRidge endlessly to find most suitable settings. 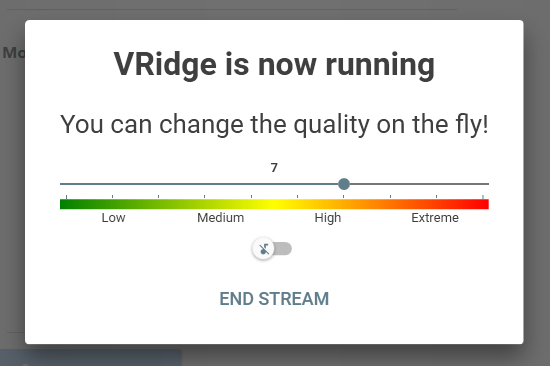 Just use LIVE streaming settings to optimize your VRidge experience (advanced live settings are also available). Completely new software architecture allowed us to make VRidge software much more stable. No more full software restarts when something fails. We now have much better tools to integrate third party solutions. More on that soon! If you have a modern NVidia card you can use Moonlight streaming instead of VRidge. You might receive better results in terms of latency and image clarity. To learn how to use Moonlight with VRidge - read about it in the Moonlight Basic Guide. We have implemented multi language support. We support English and Polish languages for now. Tell us which languages you would like to see. More coming soon! Fixed Oculus SDK games crashing when running without admin. Fixed FreeTrack sometimes crashing app. Fixed NOLO wired (desktop driver) positional tracking. Fixed trial timer sometimes ticking down incorrectly (visual error only). Fixed resolution sometimes not refreshing in UI in basic mode. Fixed file lock problem causing both apps to lock up if error was encounter during settings change. Fixed moonlight distort not being refreshed when .cfg changed. Fixed background update check crashing RiftCat client when Internet went down mid runtime. The instructions below will help you join the VRidge 2.0 Beta program. Install the client like any other Windows program. The installer is fairly easy to use and should get you up and running fast. You will be prompted to install separate VRidge 2.0 application. Google Play will install the VRidge 2.0 App on your phone after your acceptance. You can now connect this newly installed app with RiftCat desktop Beta client - enjoy and let us know if you encounter any issues. This new pc version and the original 1.5 beta can coexist in the same pc? Also, this newer beta 2.0 ask excluse permision over nolo device? Yes, you can install both side by side. No, the new version doesn't support NOLO yet. Wired support will be probably patched back in next week and wireless maybe a bit later but it's one of our highest priorities. Wired NOLO controls not working? Should be working again now with 2.0.1 update. Hi, glad to hear that the nolo will be sopported soon. I have nolo and kinect 360, can it works together with riftcat to get full 360*? We haven't tested this scenario but external drivers have capabilities to fully override our tracking so it's up to 3rd party devs. you could use driver4vr for that. Can we get a link to the APK direct download to side-load? Google Play seems to think my flagship phone can't handle the beta. What's your phone model? We're going to check why it's excluded in G Play. On my S8+Gear VR it gets stuck on "Trying to connect" and says "Looking for RiftCat desktop app" on the phone. 1.5 still works. Any ideas? Also manually entered phone IP and didn't help. I am pretty sure you would not make the mistake that I did. Loaded the Beta on my PC and then opened the usual vridge (not v2 beta) on my phone. Will not connect even with manual IP. Loaded the v2 beta on my phone and connects immediately.... I use S7 Edge + Non gear headset. The line between 2 screens is not centered . The overlay is rendered by Google Daydream side of the process. Do regular Daydream games have the same problem? Thanks , In Google Cardbaord Demo , there is the same issue. But in Game "Voxel Fly", there's no any problem. I tried changing cardboard profile , nothing better change happened. Installer link was updated to fix this problem. Unfortunately my installer still gets stuck at 80%. Is there another fix? can you please upload a simple full package. Using installers on my computer is a general problem no matter what. would rather just have a full package so i can see what is going on with my connections and not rely on the 80% installer. WOW! I like the new UI and color scheme. Everything is working smoothly with my S8 and Gear VR 2016. Although I did have to manually inject the Oculus ID on both S8s I tried, when previously I didn't. I tested on 5G wifi, but I also bought a USB-C to Ethernet adapter, and performance is just a bit more stable. Better yet, if it were to "just work" through tweeks in the app, I would be even happier. I understand the technical limitations of running through the Gear VR as it requires the phone to be the host, but I'm wondering if native RNDIS on the S8 changes this limitation? If I recall correctly, this used to work in 1.x versions. It became possible with new Gear VR 2016 because it supported USB OTG passthrough (previous Gear VR editions didn't have this capability). I wonder what changed that could break it. We need to order one of those USB-Ethernet adapters to include it in our tests. Actually, my USB to Ethernet adapter works without a problem. It's when I go straight usb to usb that is the problem. Again, I'm unsure if it is a problem with my phone or just a windows firewall issue, as the usb to usb network does show up in windows and riftcat, but wont connect in riftcat. But the usb to ethernet adapter works just like my wifi connection when I route it through my router. I was just hoping to bypass the middle man and go straight into to my pc. Oh, I misunderstood. I actually haven't checked dev options tethering settings. We're going to test it out. I was using a BT Home Hub as a wireless extender but got frustrated by random drops in quality. So I dug out my USB C to Gigabit Ethernet adapter to try that again. I was so glad I did. I can now ramp up to the Extreme setting with no issues. So I agree with Jason Beger. If your phone supports Ethernet then use it with your Gear VR (2017). My RiftCat VR has never been so good. And shows the amazing work the team has put into this amazing piece of software. What should I do? How to fix? I have exactly the same problem, I am using a Galaxy S8 with 2017 Gear VR, I followed the Moonlight Basic Guide, but head tracking doesn't work, it's like the screen is frozen in front of you, no head tracking what so ever, games don't respond to head turns at all but without Moonlight it all works fine. I have everything loaded correctly on the phone and PC and I have a fully paid up account for unlimited access,I hope you can fix this, Mark A. Gear VR app doesn't work with Moonlight since Moonlight itself isn't native to Gear VR. In current implementation we have no way to run Gear VR app in the background (to capture its tracking sensors) and Moonlight in the foreground at the same time. We will be exploring option of using Gear sensors in the background with Moonlight in the foreground but this might be tricky. For now, you can use Moonlight mode + Daydream app (as a background tracker) or Gear VR app without Moonlight mode. What is the status of Leap Motion support? I can't seem to get hand tracking to work using the old guide. Will this be updated? The old guide wasn't tested with 2.0 yet. I added it to our task board. Yikes... I was looking forward to this but it crashed before I could even load a game (while changing settings), and now it repeatedly crashes on startup. I'll email you the logs. Started client on PC, started client on phone. PC client crashes trying to connect to phone. Entering IP doesn't help. Windows 10 64 bits, Oneplus 3T. Are you using any FreeTrack/FreePIE plugins at the same time with NOLO or is it simply NOLO + VRidge without any other 3rd party plugins? I notice the wobbling happens when freetrack orientation and position are selected. This is however the only way to use the nolo vr controllers since any other option does not use them. Thanks it works fine now! Anybody noticed a FOV difference with the new 2.0? The app is a lot more reliable than before, but the FOV is completely different on my Pixel XL 2, kind of ruining the experience. Generally, size of those viewports is defined by Daydream SDK, which takes the parameters from Daydream View or preset selected by tapping cogwheel and changing headset in there. Please try setting different preset there. For our Pixel XL (1) Google Cardboard preset fits the best for generic plastic/cardboard headsets. have been playing around with version 2.0. I like the layout, that's quite nice. I have been getting random crashes after confirming my configuration. For some reason, HEVC doesn't appear to be working on my Samsung Galaxy S8 Plus. I'm just staring at a grey screen with the lines. Tracking was working up to a point, although it was terrible. Not smooth at all. And then, tracking stopped all to together which made me feel very sick when turning my head. This is using the Gear VR version. Compared to what I'm used to with the Gear VR and S8 Plus with the smooth head tracking etc. This was a bit of a come down. I know you'll get there. I can't wait. Which S8 Plus variant do you have - US or International? How do you enable diagnostics in version 2? My phone is the international variant. I believed it worked on 1.5? Will have to retest. Just though I'd add this. I have a USB C gigabit Ethernet adaptor connected to a gigabit switch which I just installed. My PC is also connected to the switch which is connected to my gigabit router. I have a suspicion that the HEVC issue maybe related to the Oreo beta my UK S8 Plus is running. On Nougat I am pretty-sure HEVC worked fine with the 1.5 beta. Just tested 1.5 again and I get a black screen even if the Windows Firewall is disabled, If HEVC is enabled or not. So back to version 2. But as for HEVC it very well maybe Oreo beta issues. I have reported possible HEVC problems to Samsung as I am part of the UK Oreo Beta test program. The jitter is better since enabling VSync and setting texture filtering lod to Clamp. As for the rest of the jitter etc. It is present on the new black connection screen with things flying in the background. This is before streaming has started? We have just released 2.0.2 that should solve some crash loops. Also, please check GPU performance options if you are using NVIDIA Optimus enabled laptops. If you still experience crashes, please send logs again after reproducing your crash with v2.0.2. It has more error logging so more details will be visible. It should launch your default system browser asking you to login in there. It's working for us. If it continues to fail for you, please send files in Riftcat/logs directory to support@riftcat.com with problem description. I have a USB C USB 3 hub/Gigabit Ethernet Adapter connected to a newly purchased Gigabit network switch. Which my PC is also connected to. The switch is then connected to my Gigabit router. The PC Ethernet is of course Gigabit too. Testing the standard 1.5 version with the adapter connected to the phone of course :) I get a network delay of 0.02ms according to Vridge. I was very happy with that. But yet I get a black screen with a line down the centre no matter what streaming settings I use. I enabled Steam VR mirror and tracking was working. When testing version 2 it streams fine. Other than the slight jitters in the Gear VR version already known about. I have disabled my Windows firewall to retest 1.5, but VRidge 1.5 isn't streaming video. Any ideas? I'm using a UK S8 Plus on the Oreo beta. Thanks. Also, make sure 2.0 isn't running at the same time and that you hit Play SteamVR button in 1.5 to re-register old driver with SteamVR. Which usb hub are you using for your s8 please? I am also searching one of them fully compatible with mine. Also are you sure that you have the gigabit bitrate and not 100mbps limited by usb 2.0? I hope so much that you have more than 480mbps connection, it should be perfect for vridge and moonlight app. I have a USB C Ethernet hub that has three USB 3 ports and a Gigabit Ethernet on the end. The make is Ucouso. The USB C cable end that connects to the phone is USB 3. In have confirmed when 8 plugged it into a router that the Ethernet is Gigabit. I tested the USB 3 sockets, and the phone detects them too when a flash drive is plugged in. I cant get the version 2 beta to install, i download load it, run it and withing about 2 seconds i get the error Riftcat20Installer.exe has stopped working, i don't even get chance to install it. I've tried with my virus checker turned off, turned off windows defender, tried with and without administrator privileges and it just instantly crashes. my setup is windows 10 pro x64, ryzen 7 1700 cpu(oc to 3800mhz), 16 gigs corsair vengence memory running @3200mhz, a gigbyte gtx 1070 gpu and Rog Strix X370-F Gaming MB. windows is installed on a 250gb ssd drive. i dont know what else to do. ok, i sorted it, the problem was being caused by Display Fusion Pro. i think it was because DFP adds extra icons next to the standard minimise/full screen/close icons and because the installer doesnt use a standard window when installing DFP just caused the installer to crash. i just turned it off while installing and everything now works fine, Thanks. I have sent logs from 1.5 standard Cardboard version because beta testers for Oreo on the S8 in the UK got an update today. I retested 1.5 which previously gave me a black screen when streaming. This now works again. I also tested HEVC which also works again! I have sent logs from 1.5 for the jitters on Samsung devices and logs showing HEVC working. I also tested the cardboard version of 2.0. I tested normal and HEVC, which also works now on version 2. I knew it was a Samsung problem. But much to my surprise with the Cardboard version of 2.0. When using HEVC the streaming was way smoother when tilting the phone etc. I didn't have a headset on. But I see a vast difference with 2.0/HEVC as apposed to non HEVC. Does this make sense? I know I didn't test the GearVR version at the moment. But what I was seeing on the screen looked buttery smooth when tilting the phone around. I hope this is of some use to the devs. Moonlight iOS exists and works very well. Is there a way to use it with VRidge? Awesome!!!!! Works really well so far (but I've only tested it a little bit). No drifting :) I couldnt find a setting to adjust the tracking input (gyro, magnetometer...), but so far its super precise. I had to use magnetometer with the previous version, did you integrate gyro and magnetometer into one for this build? Only minor bug so far is that once I start steam vr, the two images dont meet at the center, but there is a small gap between the two. When launching the app, however, both "test" images do meet in the centre. Not a big deal though, since my headset doesn't show the centre anyways. Minor correction to my above post. I did notice a bit of drifting, but much better than the gyro method on the previous build. Is it possible to again have the option of using the responsive magnetometer setting from before? Right now there seem to be no options (unless they're hidden). Got to say that the option to re-centre by tapping the touch pad in the Gear VR version is fantastic. Merry Christmas to the VRidge devs and fellow VRidge users. I get "riftcat client has stopped working" when trying to run, install or uninstall riftcat now. ANy ideas why I can't even uninstall without that error? I'm not able to use opentrack head tracking with Riftcat 2.x beta. Hello. In new 2.0 version, there is missing i think, one of the important settings for me. The "Scale" ane "IPS". I need this for Assetto Corsa, that have very small scale. Version 2.x does have a render scaling option, but it's hidden under advanced video settings. how to fix the display is too small on my Galaxy Mega 6.3 with a 233 pixel density and 1280 x 720, the side by side image doesnt fill up the entire screen, I used my custom profile, it became bigger but any other way to fix this? I doubt it will fill up the entire screen. I have a Galaxy S8 Plus with Gear VR and that doesn't fill the entire screen. But it's perfectly fine in the headset. For Google Cardboard style headsets if you have scanned the correct QR code for your headset all should be fine. Switching to/from HEVC while the mobile app is still running results in a grey screen, and the app has to be closed and re-started. The streamview.exe does not stay on the top of the other windows (when using Moonlight Mode). So, if i start the stream and then I open a game like Project Cars, the game window needs to be on focus because otherwise It does not receive controller inputs. When It is on focus it should be still "under" the streamview.exe program in order to not cover the "VR version" of the game. I'm using beta 2 on both phone and computer and they connect via 5ghz wifi but no game is shown on my display. I don't wanna play SteamVR games, just wanna play some PC games with Tridef. But after starting a game via Tridef, the Gear VR only says "awaiting Steam VR stream". What can I do? Tried disabling firewall and all encoders. Unless I have lost my mind. VRidge does not support non VR games. So it's Steam VR or nothing I'm afraid. Riftcat have talked about support for non native VR game support. But I think it's some way off. VRidge currently supports Steam VR and Oculus Rift games with Revive. I was told I could use it for streaming/playing my pc games on Gear VR. OK, I'm wrong. So I'm gonna try Steam VR later. BTW: Having an idea how to play my pc games with Tridef on my Gear VR? Trinus VR via 5ghz wifi is stuttering. Riftcat 2.0 dont work as good for me after 2 days of testing, riftcat 1.0 (latest version), works with HEVC and max Bitrate with USB-Tethering BUT, due to cardboard mode and no gear vr sensors i get horrible drift. I tested with others and idk why but the programm that was never working for me (stream theater) works in gear with litteraly no lag with my 2,4ghz router (moonlight). But seeing forward that these things will be fixxed. Unless the game supports the HTC Vive or the Oculus Rift (with Revive) you are out of luck I'm afraid. Basically the game must have native VR support. And either way, Steam VR will be used. Whoever told you that you could stream your normal PC games was incorrect. At least for time being at least. Other than Trinus, I don't really know of any other viable solution. When using moonlight, the app can't start Streamview (failed to start streamview.exe), tried reinstalling both (pc&app). Moonlight now works, is there a workaround for using BigScreen with Moonlight? Cause the BigScreen streams the fullscreen Streamview screen which causes my steam vr to crash because if the black warp whole the restreaming creates. (And with Tridef injecting steam before starting riftcat i got an steamvr can't be loaded, if thats a thing). Ty for the support and i like version 2.0 much more. I can use Vridge on my intel based android (Zenfone 6 A601), can i use the Vridge 2.0 on my android? Strange. My friend uses Avast, and he didn't have no such issue. Looking at the Trello board, I noticed that adding a VCE encoder for AMD users isn't even listed as an enhancement. Have you completely abandoned the AMD user base? I m having a problem with connecting my phone when i confirm that that's my phone it just Starts over and says searching for device and so over and over. Im using a Nexus 5X with android 8.1.0. I'm having this same issue on my S8. It just won't connect. It's an endless loop of search, is this your device, click yes, search, and so on. Talking of HEVC on the S8 Plus at least. It worked again for me at least when the latest Oreo beta released. Same problem! After updating the problem after 12 seconds. Samsung S8+ Gear VR Yesterday I played at the maximum settings just super! Check, please. Great update! ..a little suggestion. When you push play and you'll lanuch steam vr app make a little check if VRServer is running, if yes stop it, beacouse sometime when things goes wrong steam doesn't stop it and if you push play in vridge , steam will fail saying "something goes wrong" that's becouse VRserver wasn't shutdown before. Has 2.0 beta client limited connection time? This update isn't working at all, wireless connection crashes the min I launch steam vr, and usb tethering keeps stuck at "is that your phone?" even after clicking yes please fix :( The phone I'm using is your average galaxy s7 edge. The problem I have is that my pc recognizes my phone and it pops up the screen with "is that your phone? ", but when I click yes, the screen goes away for half a second and then pops-up again, no matter how much times I press yes, it stays in that loop, the problem occurs both in wired and in wireless mode. The old version works just fine. RiftCat works fine! My feature request is to run riftCat on two Smartphones, one for each eye.